?-Will this Chinese character appear on this comment (slightly modified from the one on your AILSA seal) or will it transform itself into gobbledy-gook? The meaning is: To enjoy. Pleasure. With the character for sound – it means “music”! After my childhood spent avoiding the cracks in pathways and then my prayerful fundamentalist protestant upbringing was put away – I saw myself as totally not superstitious. Lucky numbers? Oh, come on! Amulets, charms? For the sentimental – keepsakes I could understand – just! First major travels – abroad – some souvenirs for others and myself. Hmm. Holding memory – an anchor to that time and place. Interesting – but generally useful, too – some pieces of Orrefors or Arabia – a bell or two from my time in España. Then the loss of our first. My wife – about as prosaic as myself – took to lighting candles in churches and cathedrals on our travels. We found some talismans in Greece and in Turkey – warding off the evil eye. Then the loss of our twins: then we were together in Japan. In some Buddhist temples a vaguely female-looking “mizu-jizo” figure – small babes at foot – a place for lighting candles and the chance to dipper water over the figure/s. For women who had had abortions/lost their children before live birth (natural and otherwise)! Toys of various kind generally placed there, too. Moving. Gradually we began purchasing talismans at both temples and (Shinto) shrines: for others: good luck in exams; good health; successful birth; etc. In Canada a cousin gave me a lucky stone – similar to one I saw on your desk, Ailsa. I gave a talk in Japan about the earliest Jesuit missionary who spent a year or so there – a sizeable proportion of his time in the region where I lived – assisted in my speech by a noted Jesuit theologian cousin in London. At the site in the neighbouring city where Francisco XAVIER SJ had lived – now a rather ugly church unsympathetically designed by an Italian architect with no feel for Japanese aesthetics to replace the former “traditional” church which burned down just over 20 years ago- I found a lapel pin of XAVIER – and took to wearing it. Then a pin badge from the former Imperial Naval Academy – now a Self-Defence Forces Academy – where an Australian cousin (by marriage) was stationed immediately post-war as part of Australia’s first BCOF contingent (1945-1946). I added Jomon/Yayoi/to Tumulus era “magatama” – the curved jewel (one of the three ancient Imperial regalia – comma-shaped – some would suggest foetus-shaped) carved from agate. No, I’m not superstitious – I would tell myself – as I placed a talismanic seal on our car back in Australia guaranteeing Road/Traffic safety – or as I hung one from the rear-view mirror of the UK hire car! (They inevitably worked, by the way – never an accident!) And now – in jars and drawers – there must be a hundred – a cousin visiting the other day tipped out a tall glass cylinder of the things – a good 50+ in it alone! In the last city in which I lived a good mate was the Shinto priest of the centre city Shrine. I became aware that he was clairvoyant. Unbelievably so. I never asked about myself – each day unfolds in its own adventure-filled way – unswayed by another’s forecast – but he “saw” things about a friend’s daughter in Australia who had suffered a near-fatal fall – and for whom he saw full recovery when it seemed impossible. And so it came to pass in super-quick time. I happily wear the honorary shrine member’s pin-badge he gave me! Why would one not! 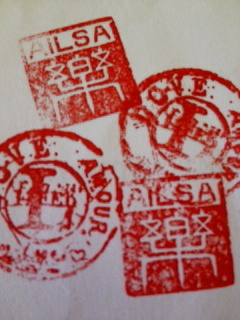 And Ailsa – I have my ticket for the Writers’ Festival session: “Lost and Found”! Jim! This is like a tone-poem of memory and loss and grief and resilience, full of such wonderful images and sentiments. Thanks so much for giving so generously of your life and your thoughts. Really beautiful. My heart went out to you and yours so often. And then it was restored by what you found. Hope we can find each other for a hello after the SWF session. What a treat. We can be FOUND! Thank you again for all that beauty. Mike! What lovely titbits of news! Buen Camino from glorious Merida. May the road bring peace and happiness. My whole house is full of talismans from the nick-knacks on my desk to the books and photos on my shelves,everything seems to be some external memory that I have surrounded myself with,lest I forget. I loved how Janine mentioned the bower bird in her talk and there was a sculpture of a bower bird not far away at the Festival,as luck would have it. I think we are all bower birds in a way,how we go about decorating our own nests with memories and trinkets,if not to impress others then to make an impression on ourselves. All the books I have bought at the Festival over the years are more than books to me,they are memories of fascinating talks by the authors who have changed the direction of my life by giving me little pointers as I walk on. Life is a journey,more than a destination,I feel,and it’s interesting to see where the next few steps on that journey will take me on life’s mysterious walk. Seattle to Brazil (10 000 km),a walk he felt destined to take and now he is dead,hit by a truck in Lincoln City,Oregon.Not far from Cheryl’s Pacific Crest Trail. So,you never quite know when the journey will come to an abrupt halt in life’s weird walk,again emphasizing it’s the journey and not the destination in life that counts. Also odd to me in relation to my nest post about crows and ravens was that Richard Swanson (swan,a bird also) had a son named Raven. Delicious connections and ramblings, Darren. Really lovely. And yes, I too saw the article about the man who was killed on his walk. So sad. 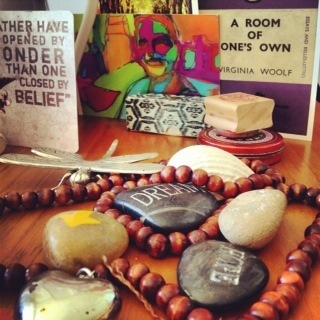 Looking at your photo of the stones with words on them and the Virgina Woolf book “A Room of One’s Own” reminded my of the story of Virgina Woolf’s death where she let her thoughts weigh her down to the point that she filled her pockets with stones and walked into the creek near her home and drowned herself. A good metaphor to never let our thoughts weigh us down that much. Darren! I had not made that connection, but yes, you are right. I am mad for Virginia. Read “To The Lighthouse” at Uni, and didn’t really grasp it, but knew I was onto a mind I admired. Then I slowly trailed her and realised she was a vast spirit I wanted to hold close in my life. Now I go back and back to her writing and find it miraculous. That death seems unthinkable yet inevitable somehow. Thanks for making that connection. Beautiful. I shall layer my talismans with more meaning as a result. And I clearly have to read the Nests book. I found ‘Nest’ a good book on a lot of levels,although it’s more about birds,art and literature,and how they influence one another. There are a few nice colour photos in the middle,but it’s not really a coffee table book…although it could be I guess. I would probably not have bought it if I hadn’t of seen Janine’s talk,but I’m glad that I did,because I found the book worth the read. Hello again Ailsa. Hope the Sydney Writers Festival goes well for you. Wish I could be there , but hoping to get to the Byron Bay Festival again in August, so perhaps you will also be at that? Your words always touch me and I loved reading about your rubber, and your other treasures. Although I am not much of a one for talismans ( talismen?) I think my mother’s white gold wedding ring ( cut where they had to remove it from her finger) I wear on my right hand is something approaching the nature of one. I feel a little stronger when she is riding on my pinkie, her life and wisdom at my fingertips, so to speak, and if I forget to put it on when I am going out at times, feel anxious it will be stolen before I return home. So while you say, you are finding writing at present a “plod”, I procrastinate. You are putting steps one in front of the other. I am circling and weaving. I need straightening and stiffening and turning to face the front. Thanks again for the brace to help me stand. Hope to see you soon at one festival or another. 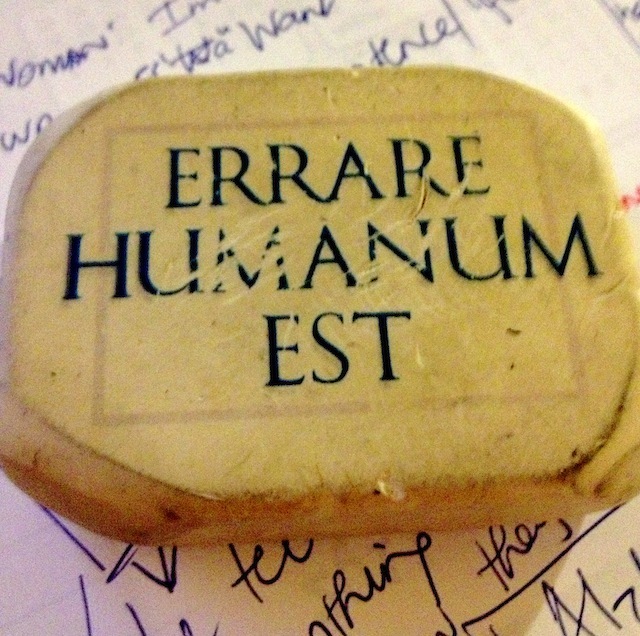 One of my least attractive “talisman” is the brace I wear around my lower back when I sit to write! It is a marvellous help physically, but also reminds me that I’m working. Stick at it. It’s like the belt my mother used to cinch around her waist when she was working on horseback. Work! Maybe wearing that lovely ring of your mother’s is a good idea. Those little reminders are very potent when they combine our own body awareness with something as deeply personal as the ring. Thanks for sharing such a lovely memory and reflection. I too wish I was going to be at Byron, but it is probably too much to have hoped for an invitation two years running, and I can’t afford the fare up for myself. I will just have to ehar about it from friends who can go. Face forward! Step by step. which is more about possessions than talismans,but talismans that are not used as such only become more useless mementos sitting on the shelf like unread books that stay unread. .
Ailsa! I missed the message about saying hello post to-day’s Writers Fest session with Cheryl. But I was there – near mid-2nd row – nodding in agreement with all your thinking on aspects of walking – whether pilgrimage or other. So sorry not to have waited around to speak – I had to head off immediately to another session – and in any case I know lots of people would have wanted to speak with you! La proxima vez! It was a lovely generous session, wasn’t it? And Cheryl is a great gal. Thanks for coming along – so sorry we didn’t cross paths, but I was grateful to have some of my village with me. Hope the next session was great fun, and that you didn’t get drenched! Hasta la proximal. Please. I’ve had some days here and there – old friends/old students/old colleagues – a kinsman who is just back from walking the 88-temple pilgrimage – we swapped tales back and forth (no moderator to set the pace – in the coffee shop at UTS. And yesterday & to-day on Radio National (replayed) Rachael COHN with you and Fr DOCHERTY. To-morrow is (suddenly) my 64th. I’ll be up at Blackheath – by train – to see one of my old bosses – talk books and ideas – and wash her car! Sublime to mundane – but the time on the train I’ll be reading Pankaj MISHRA and William DALRYMPLE! There are so many strings to your generous life – which you share with us with true humility and self-deprecatory aside – blessings and courage both – to you. And you will undoubtedly still be valued and loved…now you’re 64! That was the age of the Beatles song, wasn’t it? Thanks for your visit. You always bring so much. I can almost see you travelling through Central Victoria – it’s my regular walking turf, and that twisting camino down the hill to Castlemaine along the water race is one of my favourite walks. I always find that elusive commodity – peace – when I am plodding along there. I’m so grateful that the programme spoke to you. I think Rachael is making something very beautiful there, every week, and was enormously glad to be a part of it. Sincere thanks for your lovely response, and may those familiar Goldfields roads continue to bring you home, in all ways. Blessings+++ Here is one of my favourite poems, don’t know if you’ve seen it or not…….couldn’t help but think of it after hearing the podcast. march to the mind’s horizons, and endure. grins in his dusty yard like a split fruit. “The third day, cockatoos dropped dead in the air. “And I came to a bloke all alone like a kurrajong tree. This is such a thrill. I don’t know this poem, but it sings to me, and Randolph Stowe’s book, Merry Go Round in the Sea is one of my all time favourites. Thank you so very much for knowing the poem would be for me! Wonderful instinct and so appreciated. Muchas Gracias, Fr Moses.